Rotavirus is found to be the leading cause of diarrhea in infants and young children. Statistically speaking more than 500,000 annual deaths in kids less than 5 years of age are attributed to Rotavirus Gastroenteritis. It is also referred to as a democratic virus as it can equally cause acute gastroenteritis in kids from the developed as well as developing countries. Rotavirus has multiple strains and it causes diarrhea leading to a loss of a substantial amount of fluid from the body. The fluid losses in the settings of Rotavirus are enough to cause severe dehydration that if not managed properly in the hospital with intravenous fluid can even lead to the death of the child. Treatment of Rotavirus gastroenteritis is supportive that is mainly focused on preventing or treating severe dehydration and all the lethal complications occurring secondary to it. In the case of Rotavirus gastroenteritis, ideally, the kids shouldn’t get any medications to control either diarrhea or vomiting. The most important factor to keep in mind while treating Rotavirus gastroenteritis is to maintain the kid adequately hydrated. For that purpose, we may use an oral rehydration solution (ORS) initially, if the child is not severely dehydrated. However, in case of severe dehydration, the child must be admitted in the hospital and provided with intravenous fluids. The only way to prevent Rotavirus infection is by getting a kid vaccinated. In this regard, different vaccines have been used over a period of time. Rota Shield: It was the first vaccine against Rotavirus, introduced back in 1989. It was however withdrawn from the market due to its association with a serious medical disorder of the gut called Intussusception. 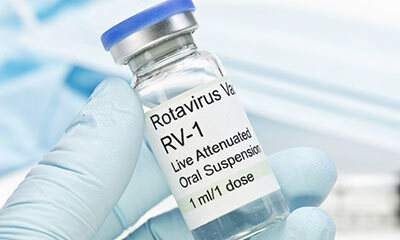 RotaTeq: This is the second type of Rotavirus vaccine, approved by the Food and Drug administration authority in 2006. It requires three different doses of RotaTeq vaccine to adequately vaccinate a child against Rotavirus. These three doses are conventionally administered at the age of 2, 4 and 6 months of age. Rotarix: Rotarix was approved by the FDA in 2008. It only requires administration of two doses, at the age of 2 and 4 months respectively. Following the introduction of the Rotavirus vaccine, there has been a significant decrease in the hospitalization rates of the kids secondary to diarrhea. In a report published by the center of disease control and prevention (CDC) in 2008, a 75% decrease in Rotavirus associated diarrhea was observed following the introduction of the Rotavirus vaccine. To conclude, the introduction of Rotavirus vaccine has not only substantially reduced the hospitalization rates and emergency department visits amongst the kids under 5 years of age, but has also resulted in a cost savings of millions. Would you like more information about vaccines? Come to Century Medical and Dental Center (Downtown Brooklyn, Gravesend, and Flatbush) and talk to our primary care doctors today.